IOS 5 was released in October of this past year. As part of this release came the opportunity for developers to start working with iCloud storage, Twitter and a new Game Center. Icloud gives applications the ability to store documents and key value data in the cloud. The service will also automatically push data and content to users' devices and also automatically update them. An application has been developed by the name of QuasiDisk. This can be found in the iTunes App Store. It is found in the utilities section. 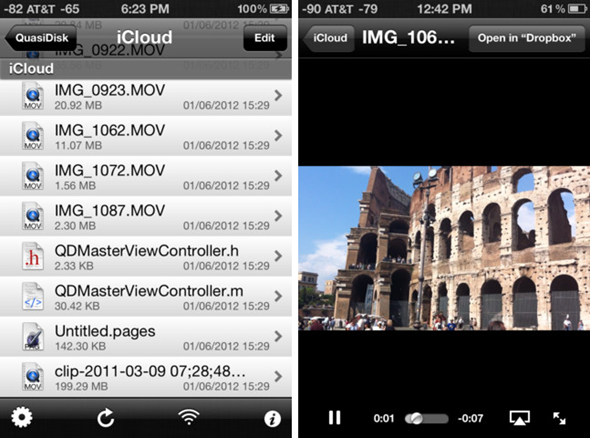 It can be used on all iPhones and iPod Touches that can run the iOS 5. Basically, this app is a file manager and lets users user whatever files, photos or documents that are desired and these can be used on the go. User’s files can be added to QuasiDisk several different ways. They can be added using USB iTunes file sharing, through WiFi over the integrated FTP server or by syncing files with an iPhone, iPod Touch, iPad or Mac over the iCloud service. You'll find that the QuasiDisk is easy to use and that it is clean, fast and user friendly. The application can support a variety of file types. These include Apple's pages documents, keynotes presentations, spreadsheets, .pdf, .doc, .xls, PowerPoint formats, .txt, .rtf, .html, various video types and various audio types. If there is a file type that is not supported, there is a fall back that has been built into the application that will allow the file to open in an application that does support that file type. We spoke earlier about the fact that the interface was very user friendly. It is simple and easy to use. It in inexpensive at a price of only $1.99 and is well worth trying it out as well as giving you an opportunity to try out the iCloud. 0 Respones to "The QuasiDisk Application"